FRANKFORT (May 18, 2017) – Kentucky’s lakes and streams are bound to be crowded with anglers, paddlers and pleasure boaters during the upcoming Memorial Day holiday weekend. Recreational boating statistics compiled annually by the U.S. Coast Guard show an overwhelming percentage of people who had been involved in boating accidents and drowned were not wearing a life jacket at the time. Federal and state law require a Type I, II or III life jacket for each person on board a vessel. Anyone operating or riding on a personal watercraft must wear an approved life jacket. Children under 12 are required to wear an approved life jacket any time they’re in an open portion of a boat that’s underway. Boaters ages 12 and older aren’t required to wear a life jacket, but there should a readily accessible one for every person on board. Operators should have passengers try on their life jackets beforehand to familiarize themselves with how they work and make any necessary adjustments. 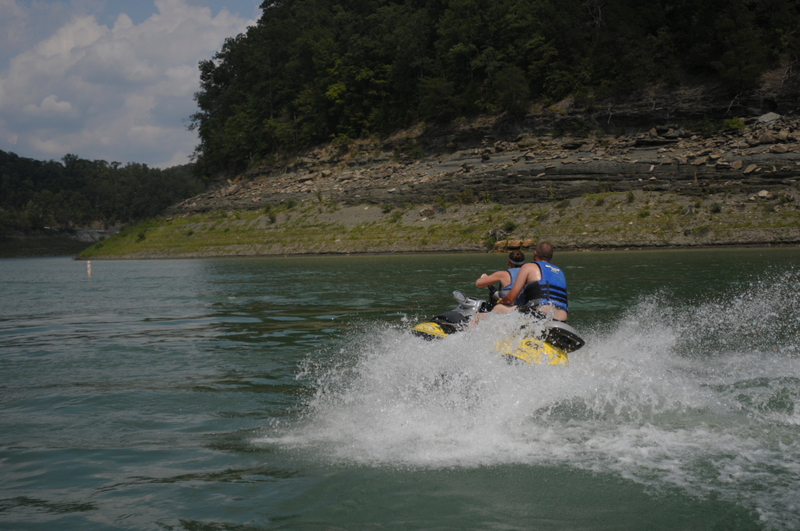 A person must be 12 years or older to operate a motorboat or personal watercraft in Kentucky. To drive a motorboat or personal watercraft powered by a 10 horsepower or greater motor, children ages 12-17 years old will need either a Kentucky Safe Boating Certificate Card or a certificate showing successful completion of a National Association of State Boating Law Administrators (NASBLA)-approved boater education course. A boater education course benefits novice and experienced boaters alike. Courses are offered in person around the state at no charge and online for a fee. Course schedules are posted on Kentucky Fish and Wildlife’s website at fw.ky.gov. Registration is required. Visitors to the department’s boater education web page can find links to the online courses as well as a boating safety checklist. Nobody wants to get to the launch ramp only to realize they forgot to renew their boat registration, or they don’t have enough life jackets or a throwable cushion, or they forgot to charge their boat batteries. Either way, you will want to have your boat numbers and decals properly displayed. Slide the registration receipt into a sealable sandwich bag and stow it on board. If the boat has an engine, lantern, stove or other equipment fueled by a flammable liquid, you will need to have a fire extinguisher. A horn or a whistle is required for boats 16 feet or longer, but good to carry in smaller boats. Test the red, green and 360-degree white navigation lights to ensure they are in working order. One small thing that is easy to overlook is securing the boat’s plug. Always double check that it is in place before launching. When lake and river levels are up, as they have been in recent weeks across Kentucky, boaters must also be on the lookout for floating debris and keep in mind that some hazards may be hidden just below the surface. A log striking a lower unit can throw occupants overboard and capsize a boat. An ignition kill switch combined with wearing a life jacket can be a godsend in such an event. Most boats are equipped with a flexible red cord or lanyard that attaches to the ignition or throttle and clips to the boat operator’s life jacket or is worn around the wrist. Should the operator be ejected from the boat, the kill switch trips and stops the engine. If your boat’s lanyard or cord is missing, replacements are available through retailers that sell boating equipment. The Memorial Day holiday weekend revs up the summer boating season and is one of the busiest boating weekends of the year. Make it a safe one by preparing ahead of time and operating responsibly while on the water.